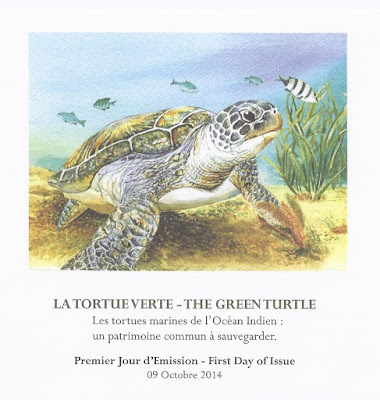 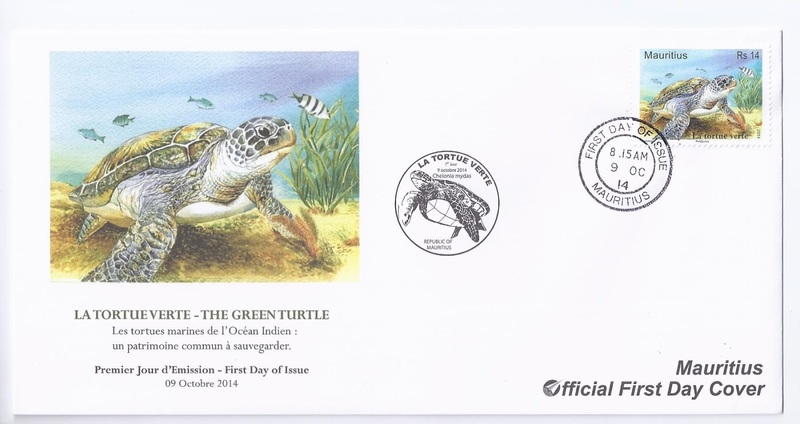 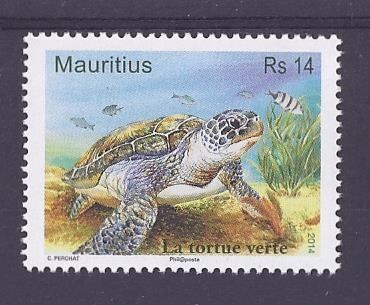 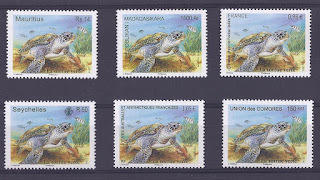 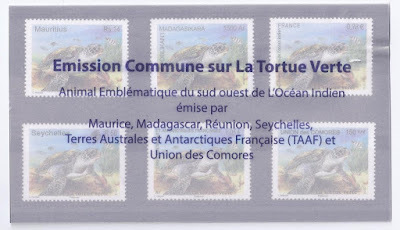 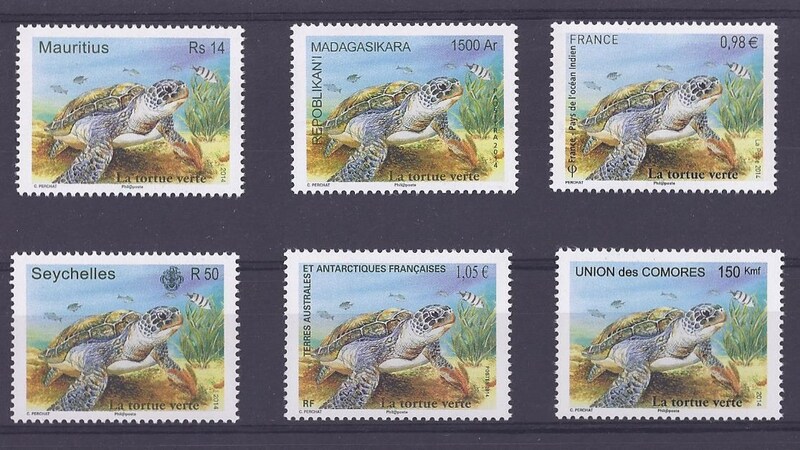 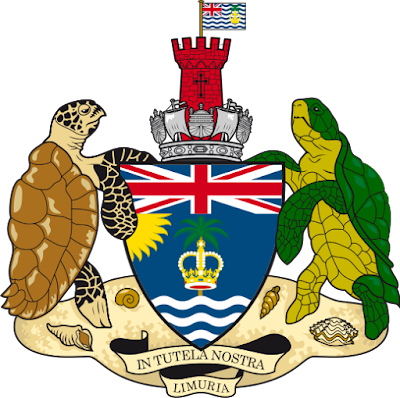 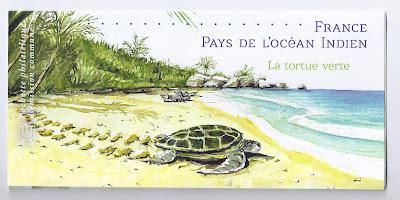 La Poste, the Mauritius Post, La Poste Comores, the Seychelles Postal Services, Paositra Malagasy and the French Southern and Antarctic Lands (TAAF) jointly issued on 9 October 2014 an omnibus stamp on the Green Turtle. 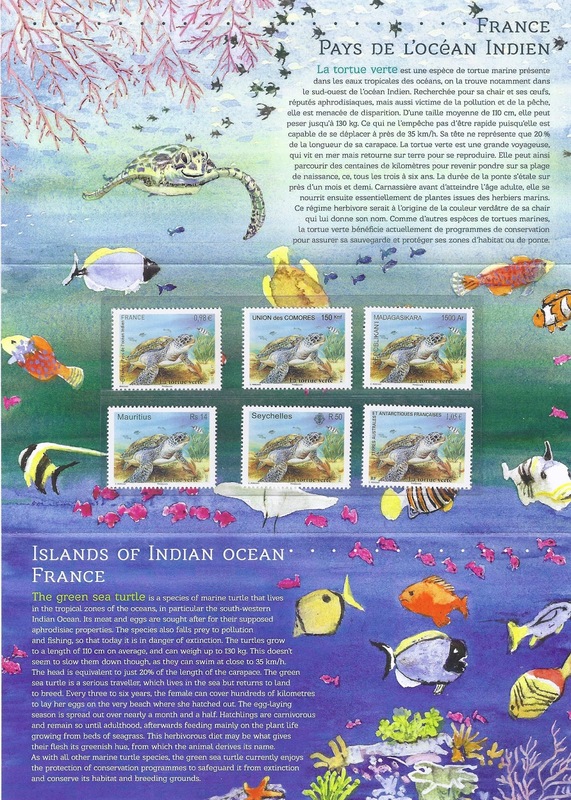 It is the first ever joint issue between countries of the south west Indian Ocean and was branded as a France - Indian Ocean joint issue. 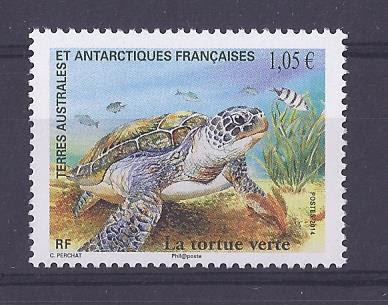 The green turtle (Chelonia mydas, Tortue verte or Tortue franche in French) is found in the tropical marine waters of the south west Indian Ocean which shelter important nesting and feeding sites for this protected species. 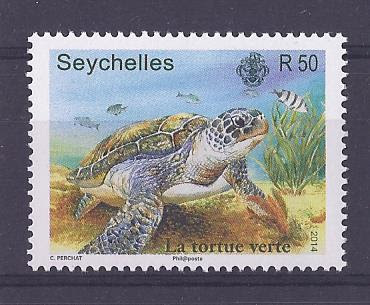 The green turtle is a great migrant that can weigh over two hundred kilograms and measure over a metre long. 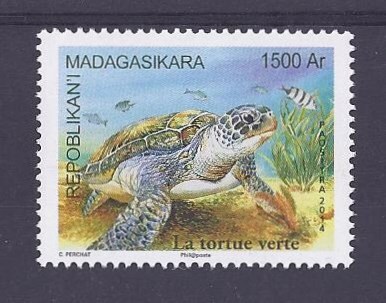 Fully grown, it is essentially herbivorous and reproduces on the beaches of tropical islands of the Indian Ocean as well as on Malagasy shores and on East African coasts. 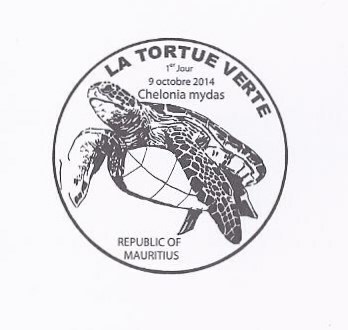 The green turtle is undergoing several study and conservation programmes in the countries of the region. The six stamps were officially launched at the head office of the TAAF in Saint-Leu, Réunion, where the 6e Rencontres Philatéliques de l'Océan Indien (6th Indian Ocean Philatelic Meetings, 9-11 October 2014) were being held. 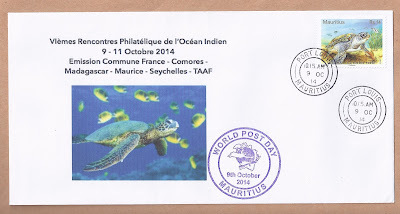 and featuring the World Post Day 2014 Special Cachet. The Indian Ocean Philatelic Meetings, RPOI, are organised by the Association Philatélique de l'Océan Indien, APOI (Indian Ocean Philatelic Association, based in Réunion, founded in 1958) and held on a almost-yearly basis. 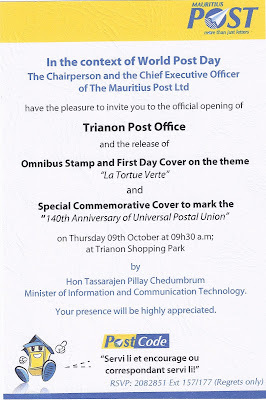 Mauritius last hosted the RPOI, the 4th, in 2012 (6-9 September, Cybercity Tower 1, Ebène), in the context of the 240 years of postal services in Mauritius. 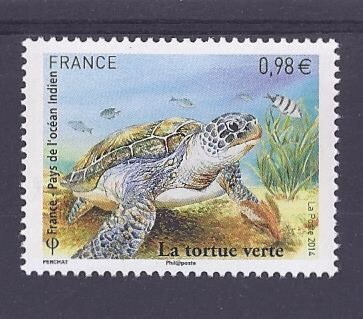 and that the French stamp was released in mainland France too. 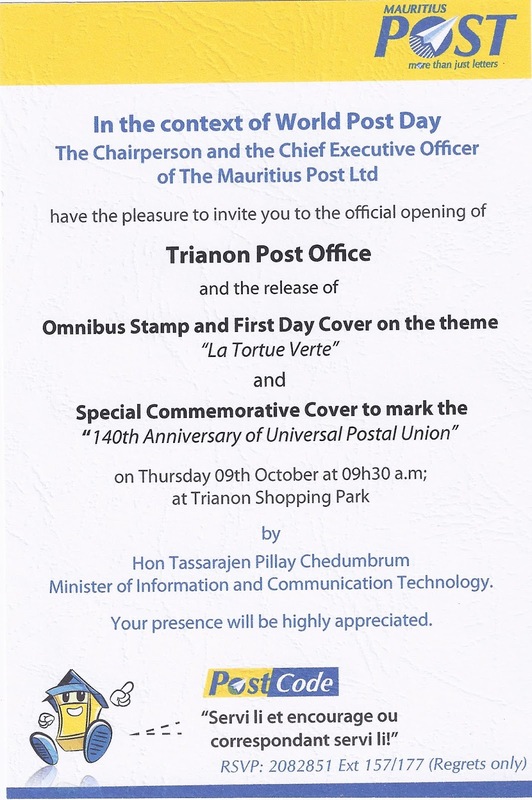 In Mauritius the official launching was done at the new Trianon Post Office. 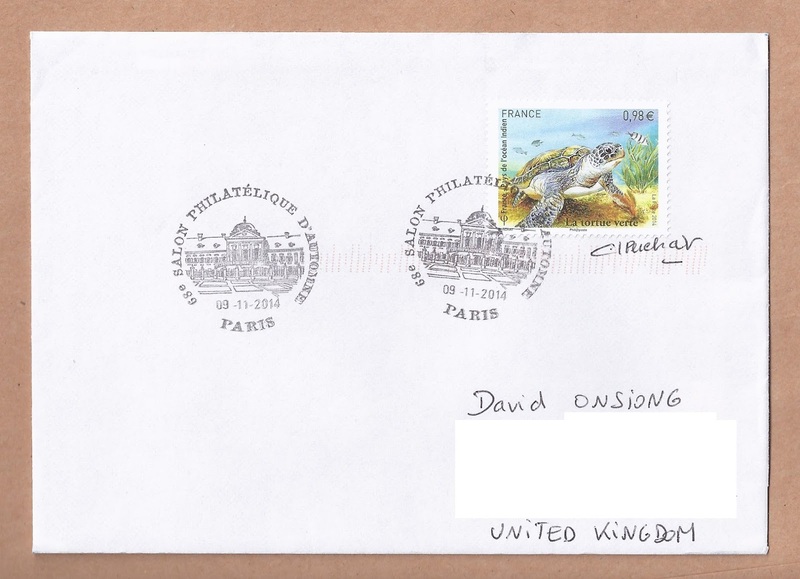 Special thanks to Eric for sending me this very nice cover from the 68e Salon Philatélique d'Automne (68th Autumn Philatelic Exhibition, Paris, 6-9 November 2014) and signed by Claude Perchat, the designer of these stamps. 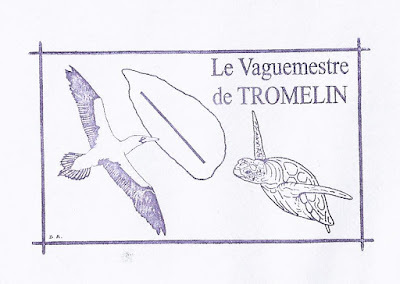 depicting from left to right a booby, Tromelin and a marine turtle. 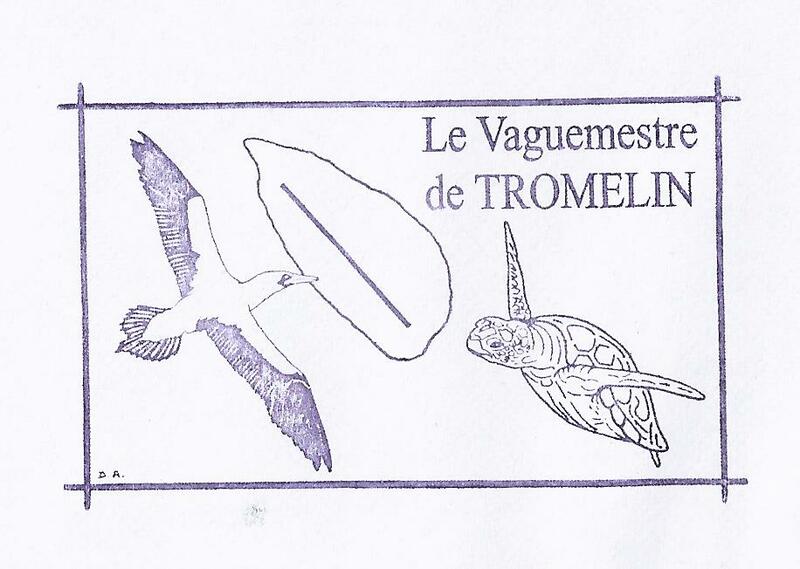 A vaguemestre in French is a military in charge of the delivery of mail. 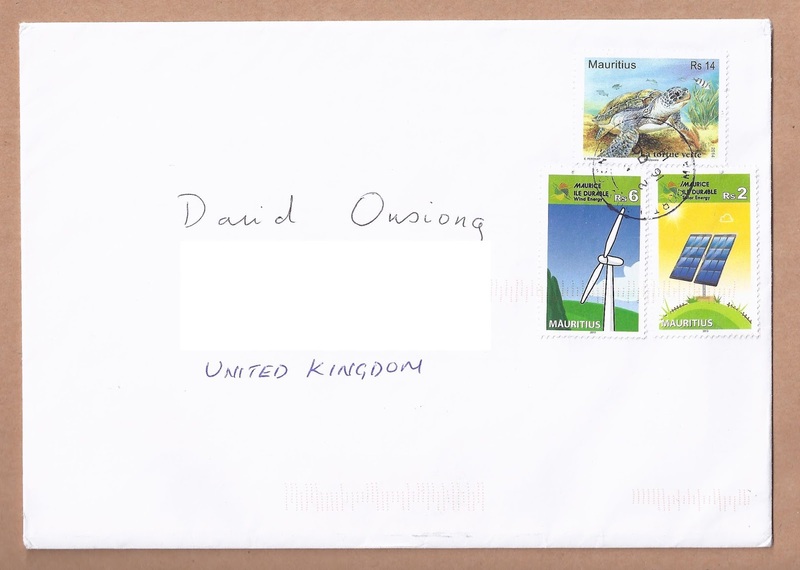 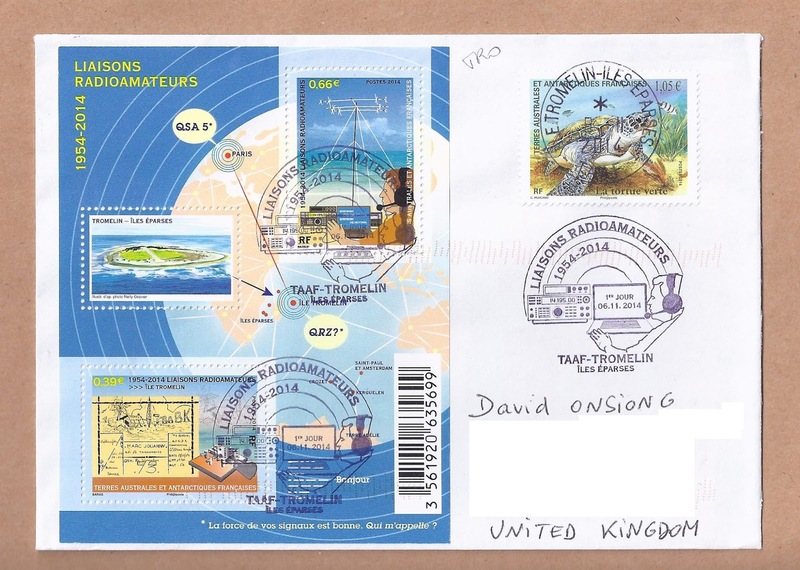 The following cover was sent from Port Louis Centre Post Office on 16 October 2014.